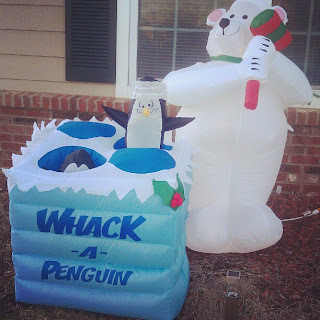 Remember the Whack-A-Penguin that we got for our yard? Kids have been taking it literally and have run up and started smacking the penguins. First of all, who allows their children to smack someone’s lawn ornament? Second of all, isn’t it already common sense that you aren’t supposed to touch? My kids know not to touch people’s stuff. Someone down the street has a giant blow up of Santa. Natalie loves it but she knows that she can’t run over and hug it or anything. I had to yell at a kid who ran over and started BOXING the penguins as they popped up. He seemed surprised when I told him no as though he’s never heard the word before. Please remind your kids that they can’t touch other people’s yard stuff unless they know it’s okay. 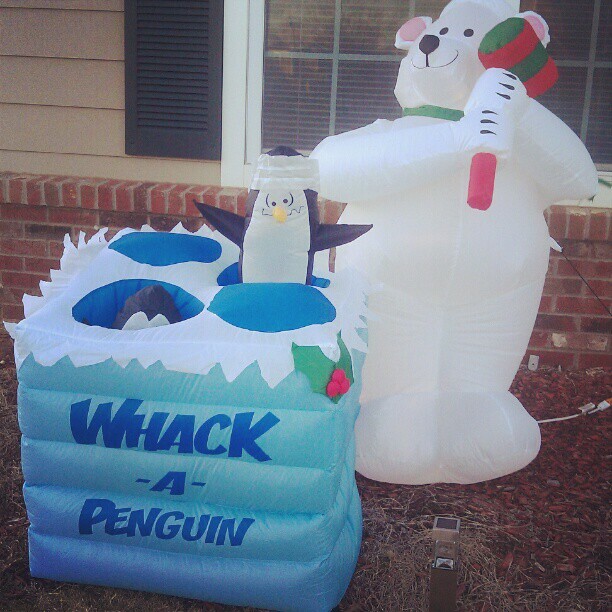 I swear, if a kid breaks Whack-A-Penguin the parents will be getting the bill. If all else fails, I’ll make a big sign that says DO NOT TOUCH. Only that’s not entirely Christmas-y. Are kids just running into your yard to do this? I was always taught you do NOT walk on other people's lawns - and have taught my kids the same. Let alone going up and smaking their lawn ornaments! No commen sense/courtesy. OMG....yes. Amen on this one! I don't understand it when poeple touch or take things that don't belong to them. Seriously, what is wrong with people? Someone needs to get going on an Etiquette Blog, seriously. it is sorely lacking in this world today. Manners matter people, always. Get an electronic fence charger and hook it up - shock those little suckers and they'll learn. I feel like I always knew it wasn't okay to just go up onto someone's lawn without their permission. Why are kids so out of control these days? people need to parent!! also some kids need a good smack! Man Im really Sorry for what happened. Best of Luck to You. You should make a sign that says, "Santa is watching you! Keep your hands to yourself!" That way it's Christmas-y haha! Common sense is definitely not so common any more. And I think you are right. And I hope you bill the parents of the kid who breaks it. The problem is that people who respect other people's property are reading your blog; those that need to be told to keep their hands to theirselves are running wild. These are the same children who think a restaurant is just another play yard. I stop each and every one and tell them to go sit down, they're not at home and they need to be still. Their mothers get pissed and I tell them their rights end where mine begin and I have a right to a pleasant meal without dodging unruly children. I don't understand thinking that other people's property is yours. Never will. I have to admit, it is a bit irresistable! My sister had a panda backpack and people kept stroking and touching it. She ended up yelling "don't pat my panda" at them... maybe you could try yelling "don't whack my penguin!"